TV star Ross Kemp led our official launch of #WalkingHomeForChristmas this week to support Britain’s wounded veterans who are at risk, some battling unemployment, isolation and struggling with their mental health. Walking With The Wounded and Help for Heroes have joined forces for this year’s campaign, which is supported by British fashion and homeware retailer Matalan. And Ross called on Brits across the country to put their best foot forwards to raise much-needed cash to help veterans and their families – simply by going for a walk. BAFTA award winning documentary maker and former EastEnders star Kemp, 54, who launched the campaign as he walked with veterans to the Cenotaph in London on Monday, said: “We owe a huge debt of gratitude to all the men and women who risk their own lives to make Britain – and the world - a safer place for us all. The collaboration between Walking With The Wounded and Help for Heroes comes after Prince Harry called for more collaboration within the military sector in a speech at the Veterans' Mental Health Conference at King's College earlier this year. The two charities have been working together delivering recovery programmes since 2012 and are honouring Prince Harry’s vision by collaborating even further. Duncan Welton, 46, of Aldershot, Hants, struggled with depression and alcohol after leaving the Army – and even became homeless – but is now back in work and rebuilding his life thanks to support from Walking With The Wounded. He said: “In the Army you believe you’re invincible and that nothing is going to hurt you. But when you come out you realise you’re not Superman and that what can hurt you may well not be physical but might be something inside. “It took a long time getting to the point where I admitted I needed to speak to somebody but it was a massive help getting to that point. Jon Giemza-Pipe, 47, from Ryde on the Isle of Wight, was helped through his rehabilitation by Help for Heroes after he was injured during a 2007 tour in Iraq. He said: “Christmas can be a very lonely time, especially for injured veterans – and especially for those whose injuries are on the inside – the injuries you cannot see. Edward Parker from Walking With The Wounded and Mel Waters CEO of Help the Heroes said “By creating your own challenging walk and fundraising you can give hope to veterans who have little to look forward to this Christmas and have walked in far more dangerous places for us. “So, what better time to give something back to those who have given so much? Ruth Smeeth, MP for Stoke-on-Trent North and chair of the All-Party Parliamentary Group for the Armed Forces Covenant, said: “Yesterday (MON) we stood together to commemorate a centenary since the Armistice. “We will remember them. But we must make sure that our history informs our present and that our dedication to those who have gone is matched by our commitment to those who remain. Thousands of people have already signed up to Walking Home For Christmas and many have taken the brilliant next step of updating their profile pages with their unique plans. PAYING IT BACK - You will recognise this man, Matthew Cope from Wales, as his story is on your welcome letter. He's now back in employment and is high on the fundraising leaderboard for his very own long walk home from work which has resonated with his colleagues. Read more here. HELPING OTHERS - Mandy Holliday from Teddington is supporting a veteran who was medically discharged by completing a five-mile walk with him. Partially disabled and with no feeling in his feet, he is challenging himself in his recovery and with Mandy alongside they are both determined to raise money for those in similar positions. BLIND MAN TAKING THE LEAD - Peter Booth from Altrincham has gone above and beyond in his Walk Home For Christmas. After being blinded whilst serving as an army officer 37 years ago, aged only 21, he has organised two amazing walks for the whole community to get involved with. You can support Peter by donating, or read more about his amazing story here. HITTING THE MOUNTAINS - Kevin Lane from Monmouth, Wales is completing a 50 mile walk home for Christmas. With a height gain of over 3,280ft Kevin is going to new heights this Christmas in order to give back to ex-service veterans who he considers as less fortunate than himself. You can support Kevin and donate here. 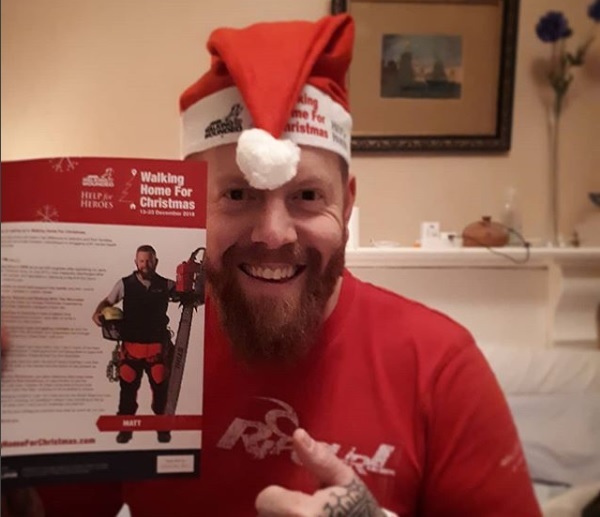 THE 999 CHALLENGE - Simon Johnson from Birmingham, a Walking With The Wounded beneficiary, is calling for anyone wanting to make a difference this Christmas to join him in his 999 Challenge. The aim is to complete 9 miles, at 9am on the 9th December, the perfect way for anyone, anywhere to get involved. Join Simon and many others in his walk here. KNEE RECONSTRUCTION - Marianne Scott from Fife, Scotland is supporting her brothers and sisters in arms by walking from Kennoway to Markinch on Saturday 22nd December. After having both of her knees reconstructed she is challenging herself this Christmas by covering the tough 16 miles on foot. You can support Marianne here. GETTING FAMILY ON BOARD - The KRH Wives and Children from Tidworth are walking 5k on the 18th November around the Tedworh House grounds to raise money for Walking With The Wounded and Help for Heroes. Starting their walk from the Royal British Legion, this team are determined to raise as much money as possible for soldiers who have been injured during service and need help with recovery programme. You can join and show your support for this team here. GOING LARGE - John Freeburn from Ayr, Scotland has decided to complete a “mega walk” this Christmas by planning on walking the whole River Ayr Way in one day. A grand total of 40 miles. As an ex-serving soldier John has set himself the target of raising £1,500 for a cause close to his heart. Help John achieve his target and donate here. WALKING TO A MONUMENT - Ian Pringle from Rugeley, Staffordshire is planning in carrying out a fantastic walk alongside fellow veterans. After completing a 20km walk from Staffordshire College (Tamworth Campus) to the National Memorial Arboretum last year he aims to complete a similar walk this year. Raising a brilliant £800 last year he is determine to raise even more money this year. To support Ian and his fellow veterans in their walk click here. RECOVERY CENTRE WALK - The Phoenix House Winter Wanderers from Richmond have planned a range of brilliant walks that guarantee that everyone can get involved in raising money this Christmas. Organised by team leader Mark Airey, a 3 mile, 5 mile and 10 mile walk have been planned for the 9th December. This is a fantastic opportunity to have a wonderful walk around the Richmond area whilst also supporting a worthwhile cause. With hot drinks and mince pies are promised upon arrival back at the Phoenix House Recovery Centre this is an amazing day for the whole community to get involved in. Show your support by donating or joining the team here. WALKING EVERY DAY FOR A WEEK - Amy Kingston from Market, Harborough has pledged to walk to work and back every day for a week. A 20 mile round trip each day, Amy has already begun her training and smashed her original target of £150. To follow Amy’s progress and support her in her walk click here. KIND KIDS - Team Noodle from Perth, Scotland started her walk home on the 1st November. Every morning she walks nearly 1.4 miles to school and on days where she has no school a different walk will be picked out. She might be small but has an incredibly generous heart and loves to raise money for charity. Give your support to Team Noodle here. CANARY ISLAND ADVENTURE - WHFC Team Caleta 2018 from Fuerteventura, Canary Islands are completing an amazing 12km walk finishing at Ocean View at the Atlantico Centre on the 15th December. Led by Su Bailey, this brilliant group of individuals are Walking Home For Christmas for the third year in a row. You can follow Team Caleta’s progress here. MARATHON WALK - Kieran Long from Stowmarket will be walking an amazing 26 miles home from work on the 21st December. Kieran has planned to make some rather large detours to nearby military air bases and war memorials guaranteeing that his Walk Home For Christmas is both fun and challenging. You can support and donate to Kieran here. FITNESS GROUP CLIMB YORKSHIRE PEAK - Whernside Night Walkers from Brighouse are tackling Whernside, the highest of the Yorkshire Three Peaks, for their Walk Home For Christmas. Undoubtedly a challenge, the team made up of members of Brighouse Commando Fit are completing their walk on the 8th December. You can follow their progress here. 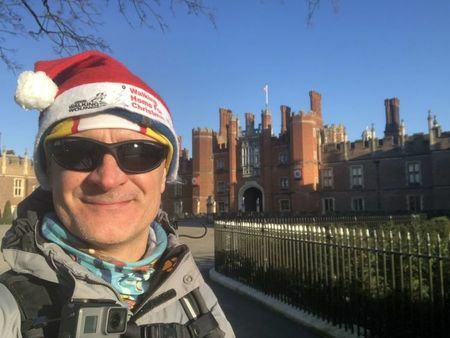 RUNNING EVERY DAY - Andy Froy from Eastleigh, Hampshire has pledged to run 5 miles a day, every day before Christmas day - an astonishing total of 155 miles. Andy has already begun his challenge and to support Andy and follow his journey click here. Sign up and add your plans to your profile page (as well as a photo) as this will make a huge difference to your fundraising calls to action. Your friends and family will be inspired to support you - and might sign up to join you too! There are many ways to get your business on board and support veterans while engaging staff and clients with a light-hearted challenge. BANKING ON YOUR SUPPORT: Staff members from TSB’s branch in Sunderland will be walking 5 miles on the 18th December from their new office in Doxford Park to their old office at Riverside House. Read more here. EVERY LITTLE HELPS: Team Tesco are walking and raising money as part of their commitment to the Armed Forces Covenant with a target of £5k. Read more here. BRANCHING OUT: Teams of staff members from Birketts LLP will be completing a number of team walks across East Anglia. Both lunchtime and evening walks have been organised at Birketts offices in Norwich, Ipswich, Chelmsford and Cambridge and will be taking place from the 6th December. You can support the Birketts team here. A SPEECH FROM A VETERAN: Staff from Alexander Mann Solutions completed their Walk Home For Christmas on the 4th December. Workers based at companies across London walked to their head office in Bishopsgate, London, where they had a talk by veteran Kate Philp before continuing as a team to the cenotaph. To donate to team Alexander Mann and to read more about their walk click here. A DAILY WALK: Travis Perkins HR/ Resources team have planned to raise money this Christmas by completing a daily walk around their head office in Northampton. Taking place between the 13th and 23rd December you can keep up to date with the teams progress here. MATCHED FUNDING: Lyndon Scaffolding took part in Walking With The Wounded’s Manchester office walk from the cenotaph to its Canada Street office on 5th December and generously offered to match fund donations. Morrisons, Greggs and Asda donated mulled wine, mince pies and hot drinks for walkers from a host of companies including Yes! Manchester, BTP Architects, BNY Mellon and Southway Housing who got their staff involved and treated the evening as a chance for a laidback, Christmas, staff get-together during their busy December periods. Read more here. Other companies that are also taking part include Irwin Mitchell, YESSS Electrical, Markel International and many others. Harry Clark took on a mammoth challenge and walked home from university in Liverpool to his home town of Bath – approximately 300km. Starting on the 14th December, he raised a total £2,203.16. Chris Barr was inspired to fundraise for the first time since school, and took on the challenge of a 15 mile walk home on Christmas Eve. He wanted to help raise money for wounded service men and women and highlight the issues, in particular mental health, which veterans can face. The Manchester Hub for Walking With The Wounded was established in 2015 following the BBC's 'DIY SOS' programme with Nick Knowles, and has since been able to support nearly 500 veterans in the North West with mental health, housing and social issues, with a saving of nearly £3m for the local council. The team asked local friends and supporters to join their walk from the Cenotaph in Manchester, to Canada Street where the hub is based. Help for Heroes Community Recovery Team, based in Wales encouraged the community to come together, inviting friends, families, supporters and veterans to don Christmas jumpers and join their walk, a family-friendly 5k for all abilities with a tour of Pontypridd's stunning Ynysangharad War Memorial Park on Sunday 16th December. Alexander Mann Solutions created a team with the aim to have 100 colleagues join their walk from their offices in London to the Cenotaph on 4th December. This followed a talk by Major Kate Philp, a former Artillery Officer and the first British female officer in recent operations to lose a limb in combat. She lost her left leg below the knee in 2008 in Afghanistan. She has since joined the Walking With The Wounded team on the South Pole challenge (racing 335km to the South Pole on skis) with Prince Harry. Euan Grassie took on a challenge with a difference, opting to run instead of Walking Home For Christmas – he took on a 13.58km distance, with a target of £1,358, to reflect the number of Victoria Crosses awarded throughout history. Alistair Nelson was joined by his friend, Giles, who both took on 28 miles over a gruelling nine hours around Salisbury Plain, smashing their initial target of £300 with a total of £1,255.50. Mark Mitchell walked from his City of London workplace, covering 70 miles (117km) along the Thames Path, River Wey and along the entire length of the Basingstoke Canal to Old Basing, Basingstoke and raising £1,600.11 for veterans and their families. Amy Kingston decided to walk to and from her workplace, a 20 mile round trip, from Monday 10th – Friday 14th, in the process raising a fantastic £688.49 against her target of £150.